This is quite a strange movie. At the first glance, you would think that this is one of those old school, eighties-style, suspense thrillers, something like The Stepfather. Featuring a seemingly simple and not too large structure, Lakeview Terrace is a story about an interracial couple who gets harassed by their black neighbor, who happens to be a cop. Now, this does not involve the department or the whole city, this is a story about a couple of characters and this is something that I enjoyed immensely. The racial tension is palpable and is one of the reasons why this movie is so good. It creates this suspenseful atmosphere that just envelops you and before you know it, you’re sucked into this rich LA neighborhood. Also, I think all of us had problems with our neighbors at some point of our lives. I mean, it’s inevitable. I remember how my downstairs neighbor banged with a stick every time I went to the bathroom after 12 pm. He also wrote me messages on walls of the building, but wouldn’t answer the door. Oddly enough, the guy who moved in after me was a cop, hopefully he didn’t know that. Lakeview Terrace raises some interesting questions, although I don’t know if this was intentional or not (in the end, it doesn’t even matter). First of all, the question of how should we interact with other people, especially with those who are determined to discard the general system of values and insert themselves as basically demigods, dictating justice as they see fit. What to do when those who were supposed to protect us are doing exactly the opposite. This sort of general question boils down to your own personality and your strategy for solving this problem. Would you move, counterattack or something else? While you’re thinking about all these things, movie unfolds at a decent pace, so when you get tired of thinking, you can check out what our power couple managed to do. SLJ was great here, threatening and authoritative, he was this cop. Patrick and Kerry were also good, especially Patrick who seems to be getting better and better. Finally, I have to mention the fact that this is partly based on a true story in Altadena, California. John and Mellaine Hamilton are the interracial couple and Irsie Henry, is an African-American Los Angeles police officer who harassed them. If you want to know more, check out this story in Pasadena Weekly. 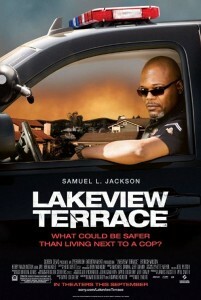 Fun Stuff: Lakeview Terrace is the name of the area that Rodney King was beaten by L.A. police in 1991. His name and famous line, “Can’t we all just get along?” is also referenced in the movie.